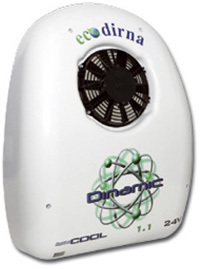 Standalone 1.2kW air conditioning unit for night-time use, fitted on the rear wall of the cabin. It is used mainly to cool the truck cabin during the drivers rest periods, during loading and unloading operations. Car transporter trucks, cranes, cabins with excess height, American cabins and cabins without a hatch in the roof. Rear installation unit available in 24v .